These mudroom storage and entryway storage ideas range in style and budget and will help you to create the perfect mudroom for your unique, small space. What is it about entryways? It seems like in a matter of seconds they can go from model home to complete chaos. The kids come home from school and suddenly there are backpacks and school supplies everywhere, discarded shoes, and a week old lunch strewn across the floor! Luckily with a little ingenuity and some elbow grease you can transform your mudroom or entryway into a stylish and organized space that you’ll love to see when you walk through the door. These mudroom storage and entryway storage ideas range from modern to classic and allow you to choose between building pieces yourself or repurposing furniture you already own, or easily buying pieces to create the perfect mudroom for your unique home. You can often find lockers for free or for an affordable price by scouring auctions, Craigslist or FreeCycle sites. This great idea featured on Apartment Therapy shows how slim lockers were transformed into a perfect small space solution for an entryway. You can spray paint them to match your design scheme and the magnetic surface makes it perfect for attaching important papers like field trip permission slips or appointment reminders to each person’s door. We can’t guarantee that it will prevent forgotten lunches or briefcases though! What if I told you that you could create an elegant shoe storage system for your mudroom using PVC pipe, paint and some wallpaper or contact paper? Pretty amazing, right? What’s great is that you can add as many pieces as you need based on the size of your family or your shoe obsession level. With the system being plastic it’s easy to wipe clean from the dirt and grime that undoubtedly accompanies shoes inside. If you’re especially handy consider buying larger pipe pieces to use as shelves on the wall for backpacks or other bags. There is something about rustic charm that just makes a house look like home. This entryway solution using wooden crates and hooks along distressed wood is sure to turn eyes. I love that it’s an affordable and relatively easy option that is versatile and can be adapted to meet your needs. Larger families could get a crate for each family member, while pet lovers might include one to store leashes and favorite animal toys. Add a cork board to keep track of notes and important papers while staying true to the look of the accompanying pieces. The possibilities are endless! 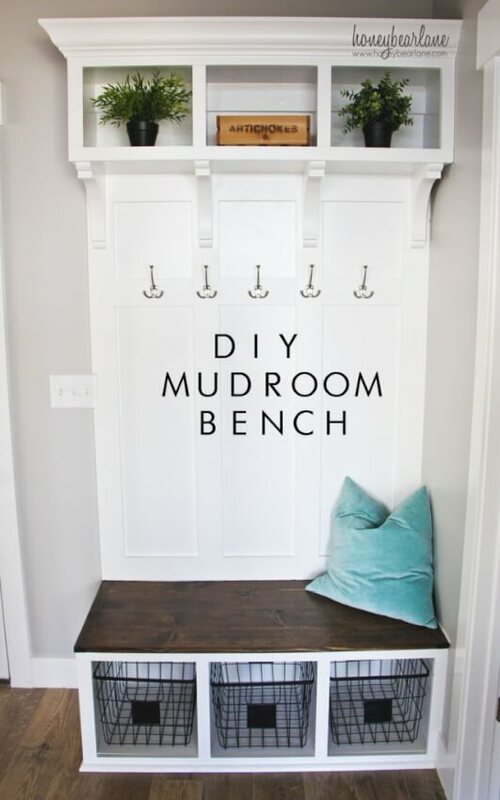 This DIY mudroom bench is not just functional – it’s also incredibly stylish. With cubbyholes on top to include decorative elements – it allows you to mix necessities with design. The hooks are great for hanging bags and coats while the wire baskets below can catch shoes, gloves, hats, or even books that need to be returned to the library. Add a pillow as pictured for a pop of color! Is there a dresser gathering dust in your garage or a family member’s attic? Lay claim to it and transform that dresser into an ideal entryway storage solution. Paint the dresser to match your décor and assign each family member a drawer to use as their own. I’d also suggest adding hooks above to hang up bags and coats. We tend to end up piling them on top of the dresser if we don’t have hooks, which kills the whole organized look pretty quickly. What is it about a cozy corner that just makes you want to sit down in it for a while and take things in? This back porch bench takes advantage of a great corner and loads of windows to be white, bright, and inviting. The hanging basket on the wall next to the door is pure genius – you could use it for mail, leashes or even keys and cell phones – I’m always misplacing those! Do you ever wonder what people did before Ikea hacks became a thing? I’d rather not know. These nightstands have been repurposed for a perfect mudroom storage solution for a small space. The nightstands come in unfinished pine so they can be stained or painted to fit and you can also change out the hardware to match your preferred style. Customize the space above the nightstands by adding hooks, a closet rod or hanging baskets. When you aren’t lucky enough to have a designated mudroom, you can take advantage of an unused corner to create a much needed drop zone in your home. This plan shows you how to build a bench that doubles as storage. The corner shelf above increases your storage and really ties the look together as well. If you need a space for each family member consider adding dividers to the bench so everyone can claim a spot for themselves. This plan is a bit more ambitious than simply creating a bench or piece of furniture but if you have the space it’s well worth tackling. Freckles Chick went beyond furnishings and enclosed an open porch to create a designated mudroom entryway. What’s great is that everything in the room serves a purpose – from the chalkboard to the bench and baskets. Those cabinets by the front door could probably disguise half the mess we accumulate daily! When you live in a small space it can be a challenge balancing your need for more storage and the idea of adding another piece of furniture. A Door Hall Tree can be the perfect solution by taking up minimal space along a wall by the front door but offering storage in spades. Between the storage bench, hooks, and shelf above, this small addition creates big storage opportunities. Part of the challenge in keeping things organized is keeping them from hitting the ground. Bags and coats hung up on the wall instantly look neater than a haphazard pile on the floor. A solution like this which utilizes many hooks in addition to shelf space can instantly create an entryway that is neat, organized, and easy to maintain. The shelves above can be used for decoration or to hold purses and other items you’d like to keep out of the reach of little ones. There’s times where you need the mudroom or entry space to do more than just hold shoes and coats – it needs to be a family command center. From meal plans and report cards to lunch boxes and back packs – it’s all here in one place! Most renter’s don’t have the option to make any permanent changes to their current home. That can make custom entryway solutions a problem. This option is easily reversible and still provides all the style and function residents needs to curb the chaos and keep their mudroom space organized. Transforming a closet into a mudroom is a great way to make an impersonal space feel more like a true home. To maximize your budget and storage solutions you should consider DIYing a room like this using Ikea pieces. For roughly $350 you can create a space that is huge on storage space while still looking modern and stylish. Ikea pieces are also easy to clean and easy to repair or replace when the wear and tear of children starts to get to them! What I especially love is the variety of options that are available at Ikea so you can customize them to fit your space and the needs in your home. There’s much value in learning how to use traditional items in nontraditional ways. Imagine combining lattice board and S hooks to create almost unlimited hanging space across a previously empty wall. From coats and bags to leashes, and baskets to use for catchalls – you can increase your storage options tenfold with this simple and affordable option. 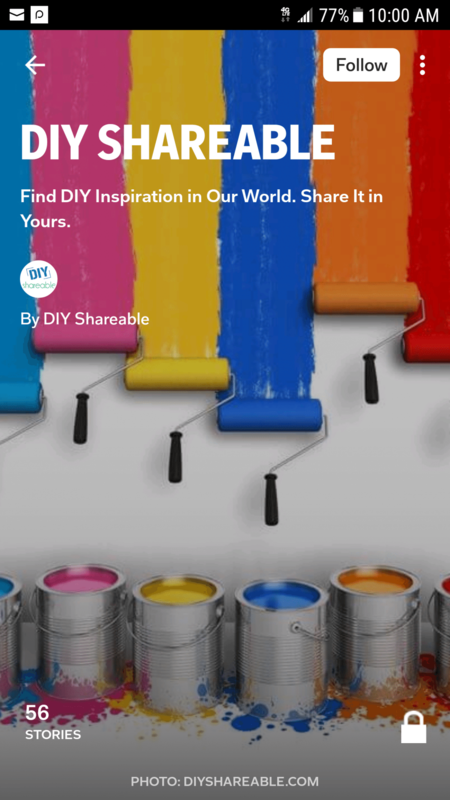 No DIY list would be complete without at least one pallet project. A pallet entryway bench is easy to make and affordable. We love that you can add cubbies or hooks as needed and the shelf space on top is a great bonus as well! When you run out of space for a mudroom, take to the walls with a hutch and some creativity! By taking the top of a china hutch along with the addition of hooks, paint and some creative style you can create a stylish entryway piece that doesn’t take up any floor space at all. With the wide range of ideas here from practically free to completely customizable or easily reversed – there should be at least one option that can fit your style, budget and needs! Remember that a mudroom space can be created anywhere whether you have a designated room or a small corner of space. Now round up the clutter and get organized!